Click a topic to jump to that location on this page. Almost two-thirds of Manitoba is covered by forest. Leafy species like burr oak, trembling aspen and cottonwood dominate the warm, dry edge of the Prairies. Further north, black spruce thrives in lowland bogs and fens, while jackpine, poplar and white spruce occupy the uplands of the boreal forest. Throughout this vast expanse live some of Manitoba’s most fantastic fauna – bears, moose, lynx, and wolves. Trees absorb carbon dioxide from the atmosphere. Through photosynthesis, they convert the carbon in carbon dioxide into structural material for growth. The world’s forests lock down about 60 gigatons (billion tons) of carbon from the atmosphere every year (2). Because they are so effective in sequestering this greenhouse gas they are highly valued as carbon sinks. 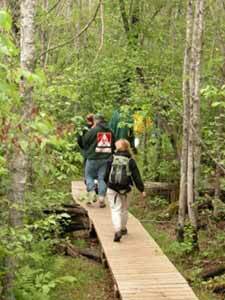 Boreal forests account for 43% of carbon sequestered in all forests and their soils worldwide (3). Climate change will have a major impact on Manitoba’s forests. Northern latitudes are projected to feel the heat of climate change more than other regions of the globe. Winters are expected to be 6 – 12°C warmer, whereas summer averages will increase by 2 – 6°C. Such changes will fundamentally alter the growth and range of Manitoba’s forests, affecting wildlife, tourism and forestry. Worst of all, climate change could result in the mass release of terrestrial (stored in the soil and plants) carbon dioxide. Where boreal forests were once sinks that locked down carbon, they may become sources, compounding the effects of climate change. As carbon dioxide levels double in the atmosphere, the seasonal severity rating (SSR) for forest fires are expected to increase by 40%. In turn, the area burned by fires will also increase by the same amount. Canada’s boreal forests are already burning out of control. Since 1977, the annual extent of burning in the north temperate and boreal forests has increased far and beyond the long-term trends in Canada (4). Massive forest fires do more than destroy trees. As wood burns it releases carbon back into the atmosphere, freeing it from sequestration. But forests are far more than trees alone. Boreal forest soils also contain enormous amounts of carbon in the form of fallen leaves, needles and other organic matter. Once the trees have been burned, boreal forest soils continue to release carbon for another 100 years (5). 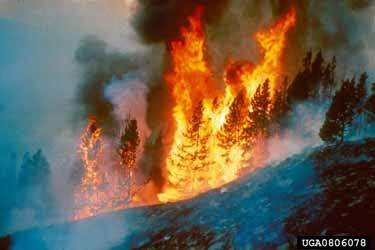 Most forest fires in Canada are caused by lightning strikes. As the climate becomes warmer and drier, Manitoba’s forests will become more vulnerable to fire. Climate limits the geographic distribution of pests. 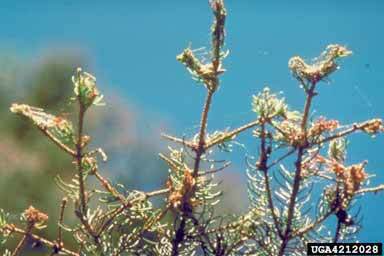 Late spring frosts help control outbreaks of insect pests in the northern reaches of the forest. The cold may be responsible for limiting insect damage at higher latitudes, effectively protecting the forest from mass defoliation. With increased global temperatures, killing frosts may no longer occur, allowing outbreaks to continue unabated in northern boreal forests. Climate determines the growth rate of insects. The colder it is, the slower insects develop. Outbreaks of defoliators – particularly budworms – often collapse when natural predators overcome the insects in late larval stage (7). The longer the worms stay in vulnerable larval stage, the more likely they are to be preyed upon, preventing them from reaching maturity and reproducing. In a warming climate, larvae would mature (and eat!) faster. According to some researchers, the effects of climate change are already at work. In the regions of greatest warming, outbreaks are already larger and more destructive than before (8). Manitoba’s forests may actually shrink as the climate warms. In the south, warmer, drier conditions would lead to the loss of drought-intolerant species, especially economically important hardwoods such as aspen (9). As trees die, they would not grow back. Rather, they would be replaced with grasslands, forcing forest animals to retreat further north as their range shrinks. The southern margin of the boreal forest will likely shift 150 – 200 km to the north (10). At the northern reaches of the province the forest would not necessarily regain lost ground. While temperatures may allow for tree growth beyond the current range, the arctic soils would prevent the forest from spreading further. Deforestation contributes to climate change. Cleared land releases tonnes of greenhouse gases. Needles, leaves, branches and roots left behind by logging operations decompose and emit carbon dioxide and water vapour. Waterlogged peat soils rich in organic matter drain and dry up without trees to shade and stabilize them. When exposed to air, they decompose releasing methane and more carbon dioxide. In many countries, cleared land is burned, completely freeing any remaining carbon directly to the atmosphere. The amount of carbon sequestered in Canadian peatlands is equivalent to 100 years worth of fossil-fuel combustion (11). Ensure that afforestation, takes place in Manitoba – harvesting wood while encouraging carbon uptake in new plant growth by replanting with suitable species. Increase the standing inventory of biomass – actively or passively cultivate forests specifically for carbon sequestration. Reducing carbon emissions by substituting wood for non-wood products such as cement, which release large quantities of carbon dioxide. Salvaging dead trees and re-using other wood products.